The Powermix Express mixer wagon is available in both single and twin auger models with capacities ranging from 9m3 to 25m3. The express comes with a unique multi position conveyor system fitted to the front of the mixer feeder as standard. 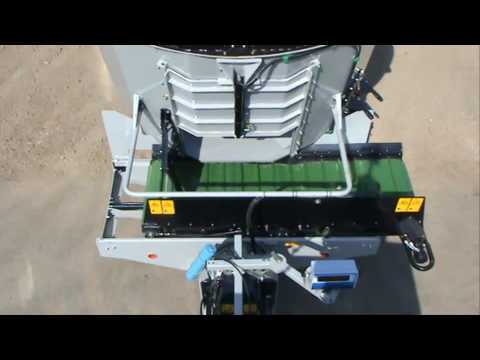 The high speed conveyor belt allow you to feed either left or right at the flick of a lever from the tractor seat. The express conveyor features an innovative webbing system adapted from root harvesting technology. This provides a strong durable steel framework encased in rubber that is modular for easy service, is capable of high speed accurate delivery with no carry-back without suffering from the inevitable tracking maintenance of traditional rubber conveyors. The conveyor bed tracks left and right hydraulically and automatically rises up to a height of upto 4 feet 10 inches each side allowing you to fed over high barriers or into ring feeders. When in its central position the Powermix Express conveyor stays within the 7' 7" width of the machine. Feed out is via a wider 3' 1" front door giving excellent visibility, feed out rate is governed by the height of the door opening and can be adjusted hydraulically to suit your requirements. The conveyor speed can be adjusted independently of other hydraulics. A fixed version of the Powermix Express conveyor is available as a lower cost option when it is not necessary to elevate the feed. This conveyor is fixed centrally and can discharge feed flat to either side. The Powermix Express mixer wagon suits farm applications where you have a mixture of feed systems, the feed passageway system can be fed by leaving the conveyor bed at its flat setting and feeding to the left or right, then you can feed into a ring feeder or over a head rail by sliding the bed left or right hydraulically to the desired height.